I'm trying to figure out what is actually going on here...yawning? Sparring with another animal? That looks a lot like my Friday kitty pic! So cute! The book looks interesting, too. What a riot! Great pic! Ha! I can't figure out what Anya looks like she's doing. Wanting to chomp down on the book? Or just speaking her mind? Great pic! How cute! Looks a lot like my Maddie. Fantastic! Definitely lots of personality there! Oh that's a great pic of Anya! Oh my gosh, that is hilarious! You need to email that picture to the author! Love your picture! Is he "flossing" his teeth on it? My cats always do that. I think it is cute but annoying. Loved how you captured that moment!! 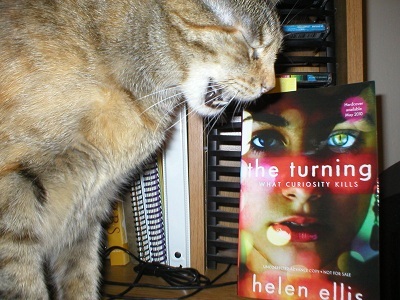 Never mind the book, it looks like your cat is spinning a great yarn herself! Oh, I love that photo! I am going to try and grab it and put it in my kitty/Turning photo gallery. SO happy to add a few words to the best Wordless Wednesday photo ever. Glad to see the book is facing out! Thanks everyone! That's my Anya. She's gotten so big. She weighs just over 15lbs now and is on a diet. Poor kitty.